Okay I knew I'd change my mind. 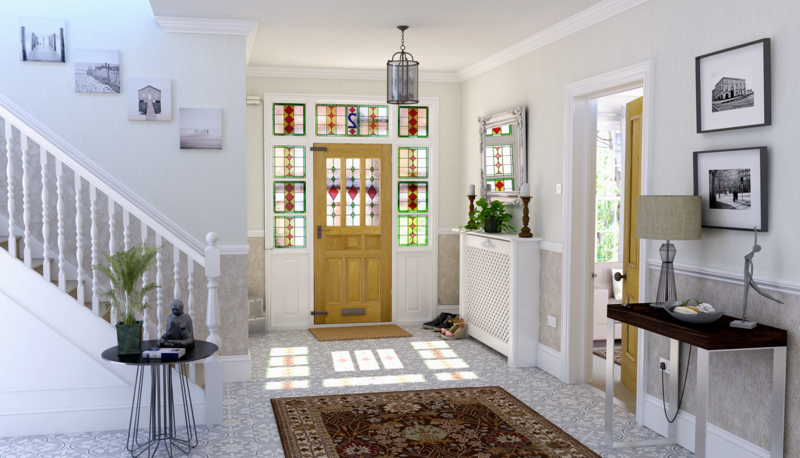 I wanted to have a go at some stained glass shining through into a white hallway. Wasn't sure if it was even possible but I think I figured it out. Lots of changes to make but I think it will be more of an interesting image than my one above. Nice, way to break the ice! This is coming along, the stained glass effect is very cool. I see what you mean about the floor; you could always try the "reset tilt" option? Thanks Justin. Reset tilt? I've not heard of that so I'll look into it. Yeah it's under Extensions > SU Podium V2.5 plus > Tools > Reset Tilt. Helps a lot with distortion in panorama renders, but it might eliminate the skewed floor problem you mentioned above. This is a raw render, no PP. I keep changing up the furniture and wallpaper, just can't find anything I like. I wasn't sure if this image would be a high enough quality so I've sent it to your dropbox as well. nice details, electrical outlets, nice atmosphere!